Photo: Getty/Ryan F. Mandelbaum/MGM. Illustration: Gizmodo. 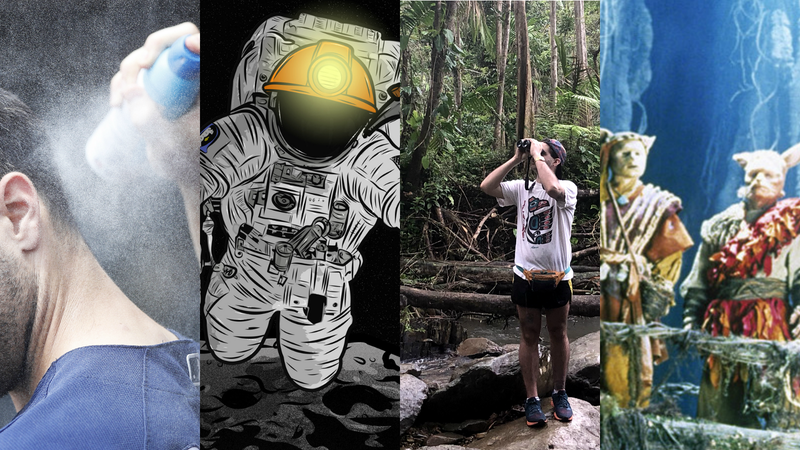 For the past week, we here at Gizmodo have been celebrating IRL Week: A series of stories dedicated to appreciating the remaining slice of our existence that is experienced offline. We’ve covered everything from how spray sunscreen is kind of terrible and the quiet joy of birdwatching to Airbnb horror stories and what, exactly, a map is. But you can hear it, can’t you? That once-distant voice has grown louder, and now there’s the sound of claws scratching at the door, trying to get in. It has tracked you and it has pursued you and it has found you, the online, and it yearns to pull you back into its infinite void. Must you fear it? Will you fight it? Or will you accept it? It is time to log back in. Or, since you’re reading this page, you already have. So now that you’ve succumbed to the digital aether once more, you might as well start catching up by reading all the best Gizmodo stories of the past week. This is not the way to apply sunscreen. I love sunscreen. I wear it everyday—even in the winter, even when it’s overcast. Applying sunscreen regularly is one of the few things you can do to directly prevent cancer (skin cancer is the most common form of cancer in the US). It’s also the best anti-aging product you can use. Do you know why older skin gets dull, wrinkled, and spotted? It’s because of years of exposure to the sun. Software updates are exciting. I keep telling my friends this, and when they get behind on their updates, I’m all, “Hey, you’re missing out on good stuff!” This is part of the reason why I’m sometimes the guy who downloads beta versions of software. The bugs are annoying, but hey, the features are better. This approach recently backfired on me with macOS and iOS 12. Unexpectedly, I think the resulting disaster made me a better computer user. Waking up in New York City can be like a safari—all you need to do is listen rather than open your phone the second your alarm goes off. I might notice five different species from my bed: sparrows cheeping, blue jays jay-ing, mourning doves cooing, cardinals pewing, and even a chickadee, well, chicka-dee-dee-deeing. If you’re reading this and you aren’t a birder, you might feel a lot like I used to feel: a little run-down from the constant onslaught of news but generally unwilling or unable to log off, even on weekends or holidays, due to your profession or web obsession. But after giving birds a chance, I have finally found a way to log off, save for a couple of useful apps and websites—and the fact that my recent history as a birder is basically an earnest expanding brain meme. Keep a close eye on the Quantum Realm in Ant-Man and the Wasp. When you see Ant-Man and the Wasp, keep your eyes peeled on the Quantum Realm. It may hold the keys to the future. In the first Ant-Man, fans long believed that when Scott Lang (Paul Rudd) went into the Quantum Realm, there were a few frames of Janet Van Dyne, a.k.a. the Wasp, in there. The theory was, because she popped up, she’d play a role in the sequel. While it was incredibly subtle, Feige and Ant-Man and the Wasp director Peyton Reed both confirmed that was true (see the image here)—and in the sequel, they did something similar. After years of declining sales, unloading $1 billion worth of patents and personnel to Google, and just recently slashing 25 percent of its global workforce, when it comes to HTC, I got one big question: So what’s left? Sure, HTC may have been able insulate its promising Vive VR business by spinning that department off into a separate company. But as for HTC itself, if all the company has left in the tank is its upcoming crypto phone and this, the new U12+, things aren’t looking good. Covers for three of Evan Dorkin’s projects. The insistent, unfiltered energy that comes out when Dorkin speaks has been all over his comics pages for three decades. It’s there in Milk & Cheese: Dairy Products Gone Bad, a new trade paperback from Dark Horse Comics that pulls together the chaotic, breakneck gag strips featuring his cult favorite creations. Even Beasts of Burden—the cute, vulgarity-free comics series focused on a group of animals, who also happen to be paranormal investigators, that Dorkin creates with artist Jill Thompson—has characters who channel the ornery vibe of Dorkin’s ethos. His newest series Blackwood, co-created with artist Veronica Fish, revolves around students who suddenly learn that the dark forces they’re studying are a much more imminent threat than they’d thought. Many devices are now pulling double-duty these days. Game consoles are entertainment streaming devices. Smartwatches tell you the time while also telling you which of your coworkers is demanding your attention. Lightbulbs are burglar deterrents, at least when they’re not setting the mood. So Onelink’s Safe and Sound, a smoke and carbon monoxide alarm with an integrated speaker and voice assistant, isn’t exactly a far-fetched concept. It is, however, indicative of a future where connected devices aren’t just for nerds. You might not need a voice assistant, smartwatch, or a ceiling-mounted speaker, but everyone needs a smoke alarm. Whether you need a $250 smoke alarm is another. The five Warriors of Virtue. I should start by saying I do not hate Airbnb. Actually, despite its shortcomings, I love it, and I use the app almost exclusively when I’m traveling for leisure. I’ve had plenty of great experiences: a villa on the beach of a surf island in the Philippines, a cabin in Scotland with a fireplace complete with a perfect-for-Instagram wood chopping station, a glass house optimal for Aurora viewing in Iceland... but this is not those stories. A girl falls into a manhole, another lady face-plants on some stairs, and one guy almost gets mauled by a goddam bear. At this point, we’re way past ridiculous, and it’s all happening simply because people are walking around like techno zombies whose life-forces are seemingly sustained by the digital fix coming out of their phones. So the next time you go for a stroll, I implore you: Put the phone down, pick your head up, and walk. AT&T’s WatchTV Is the Very Cheapest Way to Stream Live TV, But Is It Worth It? Faced with a seemingly infinite number of media subscription services, it is sometimes necessary for the modern content consumer to ask which ones are actually worth it and which ones are basically a scam monetizing our collective need for distraction and stimulation. A hell spawn infiltrated my apartment. I retaliated. Upon closer examination, I realized one of my deepest, darkest fears had been actualized: it was a cockroach. When I was in high school, before phones and cars directed you to your destination, I would sharpie directions on the tops of my hands so I could read them as I drove. It was an effective (if problematic) way to get from point A to point B without looking down at printed MapQuest directions, but it left no room for error. A friend of mine told me that, before she had a mobile navigation device, if she accidentally diverted from the directions she wrote down ahead of time, she would pull over and call her parents, describe her surroundings, and have them direct her back on course. Everyone, from time to time—or at every single moment of every single day—wishes they could somehow escape technology. It’s not ultimately that fun to be inundated at all hours with the collapse of society, the weekend activities of people you barely knew ten years ago, bad memes, worse TV, etc. You can smash your phone, or delete those apps most obviously harmful to your mental health, but people will resent you for it, and besides, you won’t actually be escaping anything: You can close your eyes in a burning building, but you’ll still feel the flames.